The Japanese call it Satori... Instant awakening...the idea that you can create something in your life NOW. In Zen there is a proverb which says, "When the student is ready, the teacher will appear." Abundance is within you. It is simply a matter of first realizing this truth and second making it a reality in your own life. Hypnosis and using the Law of Attraction to get what you want is the key to accomplishing the goal of creating more abundance by drawing from your own resources and then adding upon that foundation. Abundance is defined as: A quantity that is more than enough; plenty. According to this definition, it is realistic to then link abundance to contentment. And contentment can be then be connected to happiness. This is a very subjective state of being. It makes sense then that hypnosis which works with the thoughts and feelings present in an individual can teach you how to be happy, content and have an abundance of that which matters most to you. Abundance is something you create for yourself, using the Law of Attraction to get what you want. It may take greater motivation at work, a stronger commitment to family, or the willpower to give up that which gets in the way of an abundant life. Whatever the obstacle, hypnosis can remove the barriers. The method takes only a few weeks before the mind is trained to constantly think abundantly. 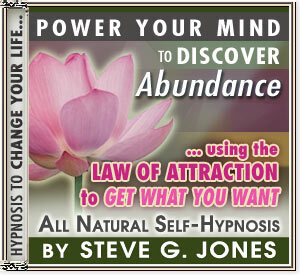 The complete process is found is Abundance, led by Clinical Hypnotherapist, Dr. Steve G. Jones M.Ed. You can create abundance though hypnosis and the Law of Attraction and start realizing your goals.